Le Labo can really play with our sensations. The nose behind this scent is the talented perfumer Annick Menardo. 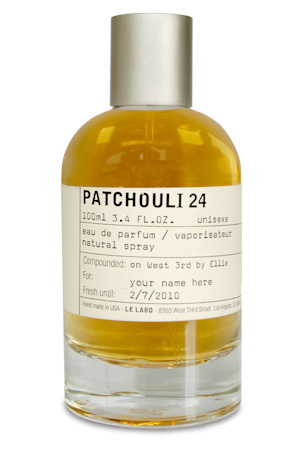 She simple took the smell of patchouli as we know, into a level that reminds us rock´n´roll. How? Because of his leathery scent that reminds us of our favorite leather jacket but with a touch of vanilla. During the day we discover new surprising notes. If you prefer straight and pure patchouli, do not look here. On the contrary, if you´re open to an idea of a fragrance that embraces patchouli but with a twist, like you´re never smelled before, welcome to this Le Labo creation. Verdade seja dita. A Le Labo consegue mexer com as nossas sensações e até com os nossos pré-conceitos olfativos. Se são acérrimos fãs do patchouli na sua forma mais pura e clássica, bem, então esta fragrância não é o que procuram. Se, ao invés, estão abertos à ideia de uma fragrância que abraça o patchouli mas que lhe dá uma 'textura' mais rebuscada e sensitiva (como nunca cheiraram antes): Bem-vindos ao Patchouli 24 da Le Labo!